The royalty rate for the entire licensing industry (brands & trademarks, entertainment, fashion, sports, publishing, celebrities, collegiate, art, etc.) is two to 20 percent. The entertainment and sports segments of the licensing industry earns a higher royalty rate than the art segment. Consumers seek out these desirable properties because of their prominent consumer visibility via advertising, events, appearance on television and other media. Therefore, manufacturers can charge more for the products and offer higher royalties to licensors. The average royalty for these licensing segments is in the 9 percent range but can be as large as 20 percent. The average royalty rate for art licensing is six to seven percent. Although, royalties can be as low as two to three percent for products placed into the mass market and up to 12 percent in specialty stores by well known artists. Note: Not all art licensing deals generate income from royalties. Read "Licensing Art - There is no such thing as a typical deal" for a discussion on other types of art licensing revenues. Royalty rates are dependent upon many factors such as the type of product, what type of retail store the product is sold (i.e. specialty, mass market, discount, etc. ), whether advances toward royalties are offered, or if the artist is well known and the art is sought after by the consumer. Ultimately the percent royalties offered by the manufacturer is dependent on a profitable gross margin (difference of cost to produce product or cost at wholesale, and income from sale of product). In other words, if there is a big enough margin between the cost in producing the product and the net sale price then a higher royalty percent may be offered to the licensor. Licensing contracts are confidential and the reason why the royalty rates of individual manufacturers are not shared on the internet. However, there are several publications (see below) that conduct royalty surveys and publish yearly reports that show a range of royalties for specific product categories. But these publications are pricey and not affordable for many artists. Note: Because of the varying factors from industry to industry and manufacturer to manufacturer, there is not one set royalty rate per product category and therefore publications show a range of rates. 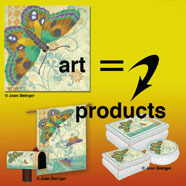 Many product categories for art have a range of four to eight percent. • "Graphic Artist's Guild Handbook of Pricing and Ethical Guidelines" (published by Graphic Artist Guild) Cost $39.99. ($22.59 at Amazon.com) The handbook includes SOME pricing and royalty rates. • "The Licensing Letter Royalty Trends Report" (published by EPM Communications, Inc.) Cost $319. The report includes charts and tables of royalty rates per product categories for different licensing segments. You can download a pdf file of sample pages from the website. • "Licensing Royalty Rates, 2011 Edition" by Gregory J Battersby, Charles W Grimes (Aspen Publishers) Cost $229.97 from amazon.com. The book includes tables of royalty rates per product categories for different licensing segments. Click here to see several pages from the 2010 edition. The answer to many questions in the licensing industry is "it depends." And that is also the case in signing a contract with a low royalty rate. Each artist has a different reason for licensing their art to manufacturers and it not necessarily to make money on EVERY contract. Below are some reasons why licensors may accept a low royalty percent. At first glance, you would think that licensing art to manufacturers that give high royalties would be the most profitable. But that is not always the case. Many times a lower royalty from manufacturers that have a high product distribution is better than manufacturers with a higher royalty and lower distribution. Art consultant Joanne Fink (now artist and product consultant) gave an excellent example of this during the "Creative Marketing Strategies for Art Licensors" seminar of the Craft & Hobby 2008 Winter Convention and Trade Show. She recounted an example of a manufacturer that licensed art for their rugs at 6% royalties to specialty stores and different art to the mass market (big box stores) for 3% royalties. The artists that had their art on product in specialty stores received $3000 in royalties while the ones that had their art in big box stores received $20,000 in royalties. Now that is a huge difference. 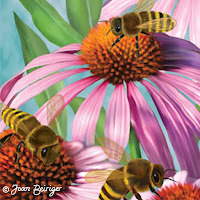 Note: The example that Joanne described happened during the heyday of art licensing. Retail sales and art licensing has declined during the last several years so it is harder to get licensing contracts with big box stores. Also these stores are doing more private label branding and purchasing art outright or using art designed in-house instead of licensing. As a licensor new to licensing, an artist may wish to build awareness of her / his art by getting contracts with key manufacturers. Thus, they may be willing to accept a low royalty percent with the understanding that if it does well she / he will negotiate a higher royalty when the contract is renewed. Also a licensor may be willing to accept low royalties if the manufacturer is willing to help build the licensors brand by advertising in various medias, arrange artist signings, interviews, etc. A licensor wants to license her / his art to a certain manufacturer because they like the quality of the products, think that the art is a perfect fit, and think the art will be successful. The licensor is willing to take a low royalty to test the market and will negotiate a higher royalty when the contract is renewed. Consider all the ramifications before accepting or rejecting a licensing contract based on the royalty percent offered by the manufacturer. A high percent royalty is not necessarily profitable. A low royalty percent may payoff over the long haul if the reason for accepting it match the artist licensing goals. This article was updated May 2014. Read the comments to this article. Agent Lance Klass of Porterfield's Fine Art Licensing shared important information about royalty rates, low royalties when stores have high sales volume, and advances toward royalties. Thanks for sharing the actual numbers...but I agree there are so many different factors to consider in a deal. You have to step back and look at the whole picture, not just the numbers. Thanks, as always, for the great info! I wish artists would ask for 10%. With most products, it's the artwork that sells the product. No one every holds up a greeting card and says how nice the paper is. (They are more likely to comment if the paper isn't so nice). I have always felt that the artwork is worth 10%, at the very least. This is an excellent article, Joan, and I hope it receives wide distribution. Most write-up's I've come across over the years which lay out royalty percentages tend to be focused more towards brands, films and characters, and not toward art licensing. In my experience, the print industry pays 10%, home decor pays 6%-7%, cards and giftware 5%, and mass-market anything, pays 2-1/2% to 3%. What can make the difference financially is whether you receive an up-front non-refundable advance against royalties. In some industries, advances can be considerable - not as high as the guarantees you can receive when licensing major brands, but still very nice to have up-front as opposed to waiting 13 or 16 months to see what royalties result from sales. Increasingly, companies are begging off paying any advances at all, complaining that they can't do it anymore because of the recession and how it has affected retail sales. I think in some cases this is genuine, but in others it's just a way for a company not to have to pay anything up-front. Volume of sales generated is another very important factor. I have no problem doing licenses for paper products like cards or gift bags for the dollar chains at 2-1/2% with no advance, knowing that the volume of units sold will be so very large that the eventual royalty payment will be significant. On deals like that, I'll often know in advance exactly what quantities are being ordered, and just what the royalty will be. Volume of sales in other industries are also important. In the current print and wall decor climate, even though you might be in a 10% royalty situation, sales might not amount to much and royalties might be minimal. Plus, many print companies nowadays don't actually print anything, and instead sell the use of the art (essentially a sub-license) to a major distributor/framer, and what they receive (in my view, essentially a royalty itself) then constitutes their adjusted gross income against which they figure your 10% royalty. It can get complicated, and royalties vary widely between different industries, and even better different companies within those industries. It all makes the game of art licensing ever more complicated, and ever more interesting! wow. Thank you for a succinct overview of a complex issue. Joan, you are such an inspiration! I propose you collect all Blog articles and create an e-book or hardcopy Amazon book for artists --sure to be a hit! You always seem to answer the questions that on artists' minds. Thank you for your dedication and sharing. Very interesting and informative blog and about the smart shopper app and I must appreciate your work well done keep it up.